The explosion of 'weather channels' – now there's 3 | Watts Up With That? While DirecTV and The Weather Channel duke it out over dollars due to a user revolt, thanks to inane announcements like the Official Weather Channel Therapy Dog, (no, I’m not kidding, and no I’m not going to submit Kenji) there’s more competition in the offing. So far we have The Weather Channel, and WeatherNationTV, and now maybe coming soon to a screen near you, the AccuWeather Channel. STATE COLLEGE, Pa., Jan. 13, 2014 /PRNewswire/ — AccuWeather is pleased to announce it will launch a 24X7 weather channel, to be known as the AccuWeather Channel, in the third quarter of 2014. AccuWeather is already the leading source of weather forecasts, information and data and is considered to be the most accurate and valuable source of weather forecasts around the world. The Superior Accuracy™ of AccuWeather forecasts has allowed the company to create a strong brand that has saved lives, protected property and placed pinpoint weather information in the hands of consumers. AccuWeather has been recognized for its innovative and valuable displays and presentation of the weather to the public and private sectors. AccuWeather’s forecasts are the most localized and most customized and it is the only source for day-by-day forecasts 45 days in advance. AccuWeather is also prepared to launch MinuteCast™, which will provide minute-by-minute forecasts for every location in the United States and Canada. The new AccuWeather Channel will be focused on helping people make better decisions in planning to improve life and safety. It will provide highly localized and customized forecasts, and will round out AccuWeather’s suite of services to the public. AccuWeather already provides weather forecasts by smartphones, tablets, AccuWeather.com web and mobile sites, radio, AccuWeather-affiliated television stations, and over 500 newspapers nationwide. The new AccuWeather Channel will be streamed on AccuWeather.com and other internet sites, as well as through media partner affiliate mobile and internet sites and is expected to be available through cable and satellite carriers. ← Dumbest climate activist statement, evar! Your satellite TV dish is now entering a high pressure zone. Accuweather has had a 24/7 weather channel in conjunction with WFMZ in Allentown, PA for about five years now. It is quite popular in that local market. It is staffed by local Mets, but the weather disco and graphics are by Accuweather and it is called the “Accuweather channel”. I’m curious — does anyone know how long these contracts normally run? 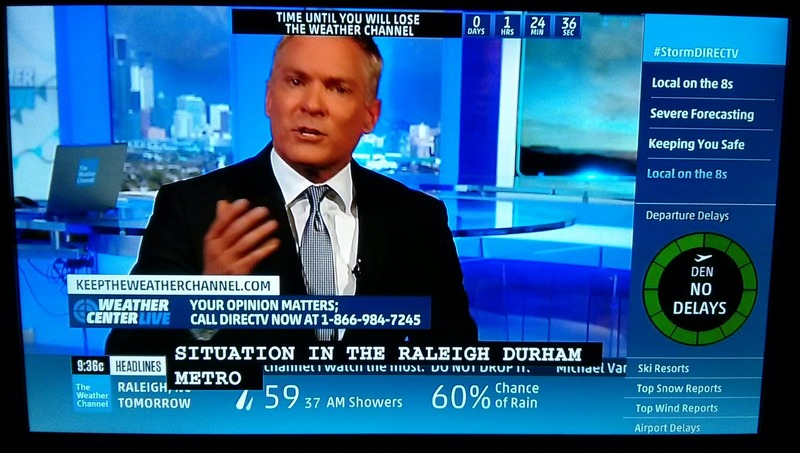 The Weather Channel has been running scrolling text across the screen since who knows when, telling us to tell DirecTV how displeased we are. A similar situation occurred this past Fall, with DirecTV dropping a local station during negotiations. Even the local station didn’t put up that much of a fight, and eventually they reached an agreement. I’m sure TWC will return before we know it. You forgot the Weather Network, which seems to be going strong. I’m not a meteorologist… but to this layman most weather forecast sites seem to simply aggregate the public NOAA data feeds. Maybe there is more to it than that, but for my locale accuweather and wundergound both seem to be about the same distance from actual when they are wrong. Million dollar idea!! (so it probably already exists:-): Forecast vs actual rating system for the weather sites. Should be relatively straightforward to do with a batched http scrape to collect the forecast data. Accuweather climate editorial seemed to have moderated a bit from the alarmist sky_is_falling viewpoint in the past year or so. I caught of few minutes TWC telling people how important they are so so call DirectTV etc. etc. Frankly, it had the look and feel of a PBS pledge drive. Looks like DirecTV have an income shortfall and advertising is light on the Weaher Channel. State College, PA? Say — doesn’t that town have a pretty good weatherman living there? In January 2010 our flight from Malaga to Newcastle was cancelled due to closure of Newcastle airport because of snow. Iwas in contact with friends and relatives at home who were telling me that the temperature was -7 to -9, Weather Channel were saying it was 0-2. We were relying on an accurate forecast to know when we could get home. In my experience Weather Channel always over-estimate temperatures, the same as the Met Office. If I’m not mistaken, TWN is a Canadian station while this post is about US stations. I never knew Kenji was pigeon-toed. Not that it would prevent a dog from hosting a weather channel. Otherwise I hope that in 1 hr 47 mins, it’s over (for the weather channel). One warmista weather channel replaced by another. I had this dream where Coleman, Watts and Weatherbell would join up and bring back the weather reports stripped of bias and propaganda…. Well, it was a nice dream. I’ve always found the 162 MHz band much more useful than a cable channel for weather anyway. 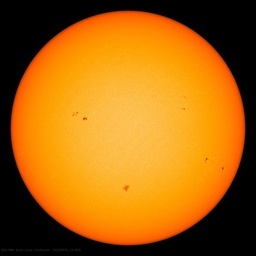 I use smart iPhone and iPad apps and local NOAA website for weather forecasts. I don’t have television. If they are going to compete with each other, we could start rating them for speed, accuracy, entertainment value…etc. We could have weather channel Emmy’s. Oh my, the possibilities are endless…LOL! When it’s looked at on a purely business level, this is what happens when you take your eyes off the ball … your business model gets shot all to hell and suddenly you’re fighting off competition from all sides, while your customers no longer want your product. What’s next? Go to the government for help to force the issue & make people use your product? All I need from a Weather Channel is the radar to tell me where the rain is, where it is going, and when it will get to me or break and let me do things outdoors. What I don’t need is to have some ‘expert’ pour urine in my glass and tell me it is wine. My guess is that theWeather Channel was done in by the lack of hurricanes, especilly the lack of killer hurricanes – that seemed to betheonly time Iever tuned in, and I’m sure this was true for many viewers. If I want to know the local weather, the fastest and best way is to hit a PC bookmark. Takes about two seconds. I always got a laugh watching the Weather Channel trying to hype up a hurricane into a monster and then watch the monster storm fizzle into a big nothing. Reminded me of that old SCTV recurring sketch with Count Floyd’s Mystery Horror Theater, which could only get crappy old un-scary films that the Count had to hype. Our taxes have already paid for, paid it forward, for NOAA that provides text and image weather info, with no need for hysteria or hyperbole. Television is the mind-sucker, chupacabra, and little death of intelligence. When we have another tornado in Wichita and that therapy dog defecates in my yard, he’ll need some therapy. Well what exactly is the Accuweather Channel on local cable that we’ve had for over 10 years? Is it not on 24*7? Is this a relaunch with upgraded programming? it’s 4 actually. Network Weather Channel is coming on October 1st, 2014. And WFMZ has had a local AccuWeather Channel for almost 14 years actually, starting it in 2001. The word “is” is replacing “are”. So much so that it is starting to sound correct. “now there’s 3” = “now there is 3”. I [hear] it on a daily basis even from professionals on the radio and TV. What would be funny is if Accuweather TV goes off foaming-at-the-mouth Warmist and gets the same treatment.